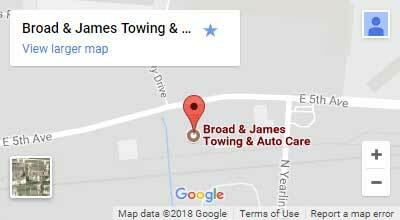 The first thing you should do is bring your vehicle to an experienced, certified mechanic like our team at Broad & James AutoCare & Towing. They will be able to diagnose the problem and give you an estimate on how much it will cost you. If your check engine light, or any other of your dashboard warning lights, has come on and you don’t know why, contact Broad & James AutoCare & Towing in Columbus, OH to figure out the problem and get an estimate of your repair cost. Don’t wait- you save money and lives when you act early!